The last post on Usmar Ismail’s “Korban Fitnah” had presented information related to one of the locations (Outram Prison) depicted in the opening sequence of the film. And by extension, accounts of incarceration in Outram Prison during Operation Cold Store in February 1963 by former political prisoners and a poem by a prisoner during the Japanese Occupation were quoted and presented as well. 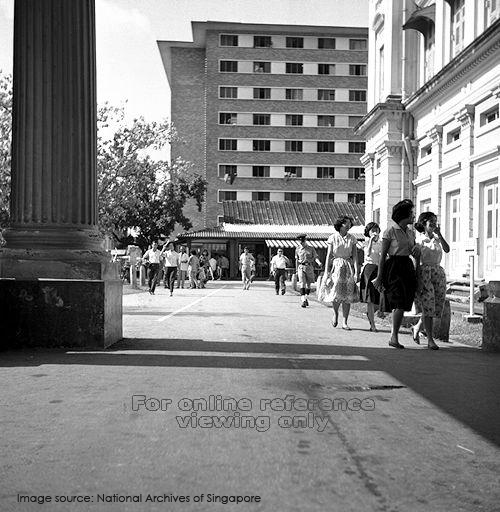 This post will deliberate on the other locations in Singapore portrayed in the film’s compelling opening sequence — that of the main protagonist Hussein in the film being escorted in a police jeep from the Outram Prison (demolished in the 1960s) to the Criminal, District & Magistrates’ Courts (demolished in the 1970s), en-route passing Keppel Road Custom House, Cantonment Road, Fullerton Road and Anderson Bridge. Film-stills from “Korban Fitnah”. The police jeep escorting Hussein to the courts travels along Keppel Road. The building on the right in the film-stills was formerly the Keppel Road Customs House, the headquarters and living quarters of the Customs Land Division. Probably built during the 1940s. It is still standing today and now houses the Customs Operations Command. Film-stills from “Korban Fitnah”. The police jeep escorting Hussein travels along Fullerton Road, passing the Fullerton Building and Anderson Bridge (in the upper left film-still) before arriving at the Criminal, District & Magistrates’ Courts along South Bridge Road, adjacent to Hong Lim Green (now Hong Lim Park / Speakers’ Corner). 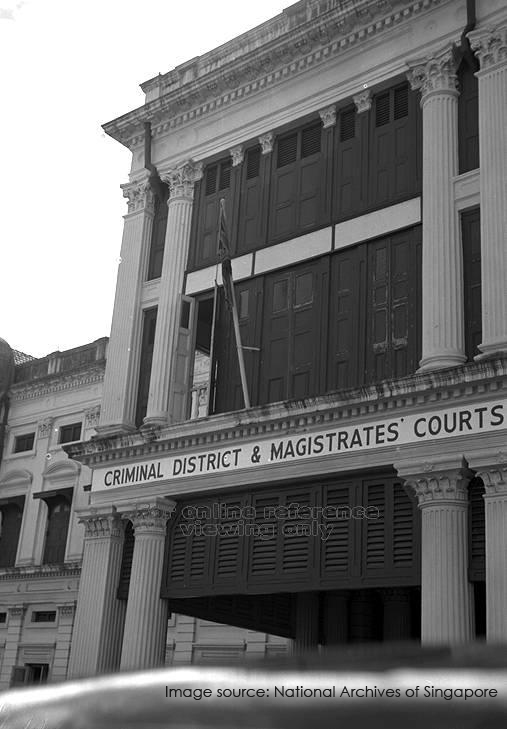 The Criminal, District & Magistrates’ Courts used to occupy the plot of land bounded by South Bridge Road, North Canal Road and Upper Pickering Street. (Refer to this map.) It was built circa 1877 and variously known as the “South Bridge Road Courts”, “Police Courts”, “Criminal and District Courts” and “Magistrates’ Courts”. 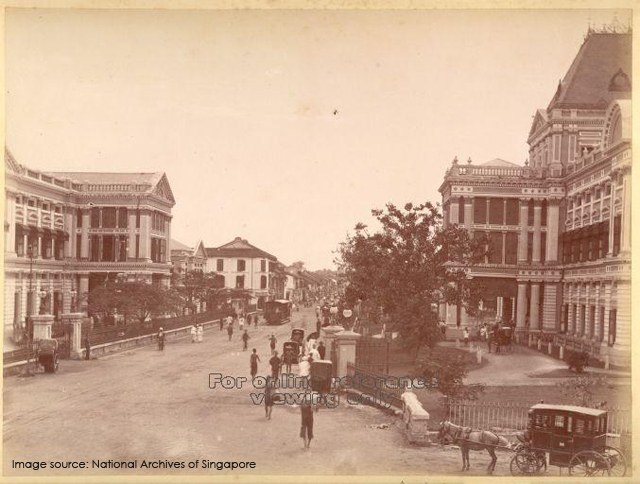 North Canal Road and Hong Lim Green, circa 1880s. The Police Courts, a colonial style building with a distinctive French roof (or mansard roof) can be seen in the background, standing adjacent to the open green space that was Hong Lim Green. Hong Lim Green was named in honour of philanthropist Cheang Hong Lim who donated the land that became the earliest public park in Singapore. It was used as a recreational ground by the Straits Chinese Recreational Club which was established in 1885. The octagonal pavilion on the right in the photograph was the clubhouse. 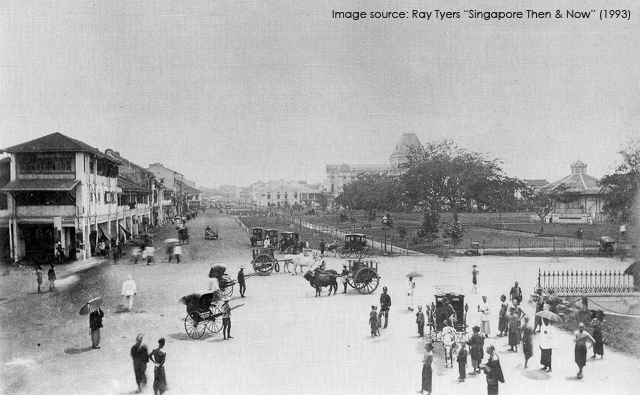 South Bridge Road in year 1900, showing the Police Courts (on the right). Opposite the courts across the road (on the left in the picture) was the Central Police Station. Both were demolished in the mid-1970s. 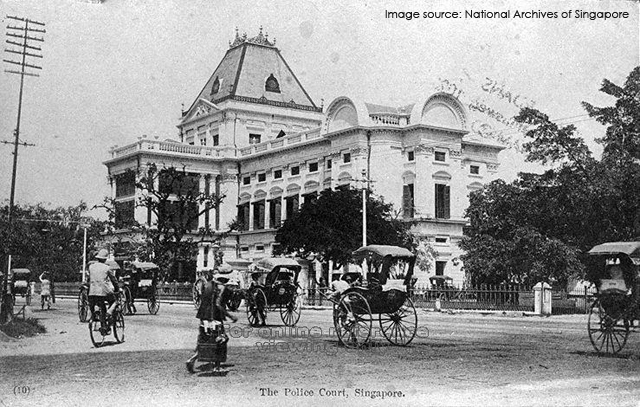 The Police Courts along South Bridge Road, circa 1911. It was indeed an elegantly designed building. The authorities then should have given second thoughts before tearing it down. The site of demolished police courts building remains empty for now and forms part of the current Hong Lim Park. 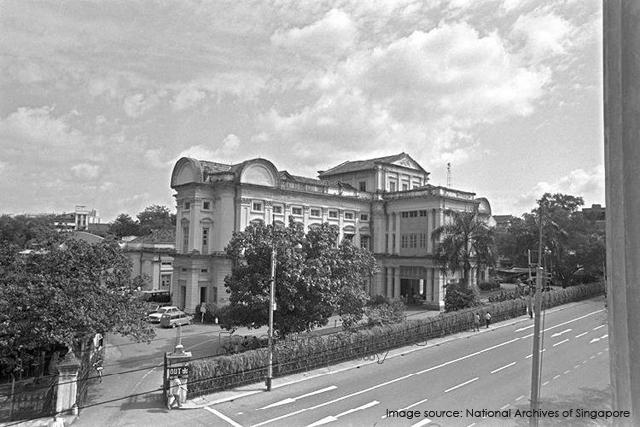 The two-storey building next to the Police Court (still standing today) was formerly the North Canal Road Post Office and is now the Kreta Ayer Neighbourhood Police Post, watchdog of the “Speakers’ Corner” in Hong Lim Park. From the National Archives PICAS website. The photo description: “A tattered weather-worn union jack on flagstaff of the Singapore Courts in South Bridge Road. 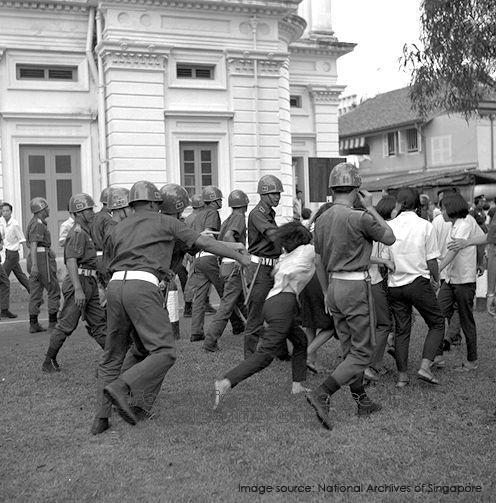 1955.” The year in which Singapore was granted partial self-government status by the British colonialists, a whole decade after they forcibly claim the territory again after the end of the Japanese Occupation. This is the same facade that we see in the opening sequence of “Korban Fitnah”. Hong Lim Park in the 1960s. The Criminal, District & Magistrates’ Courts in the background. The mansard roof had been replaced by a simpler and short pyramid roof. Was it replaced due to fire? The original Hong Lim Green was converted into Hong Lim Park by the Singapore City Council in 1960. Formerly popular with footballers, Hong Lim Green was refurbished with new grass turf, a children’s playground, a fountain, park facilities and a semi-circular outdoor stage. 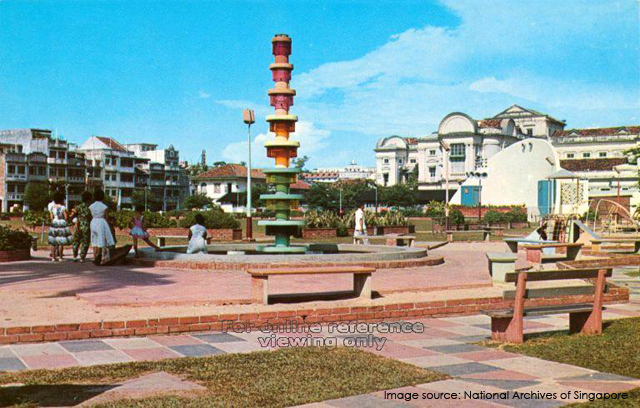 It became an attractive location for cultural shows, outdoor movie screenings and election rallies in the 1960s and 70s. 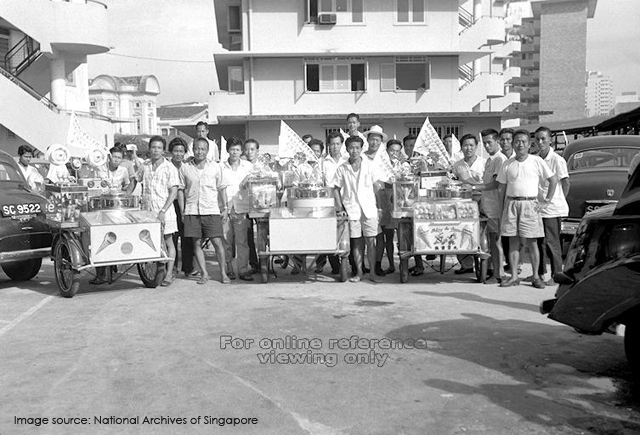 The vendors were standing amongst new public housing blocks designed and built by the Singapore Improvement Trust (SIT). Part of the Criminal, District & Magistrates’ Courts can be seen in the background. The courts stood opposite the SIT flats across Upper Pickering Street (also known as “单边街” in Chinese; translation: “single-sided street”). 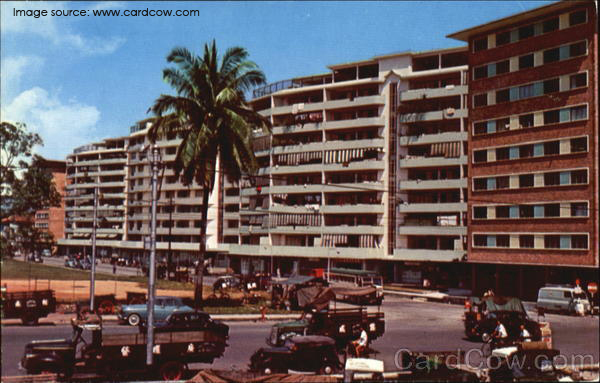 These flats would also suffer the same fate as the court building and be torn down in 2003. 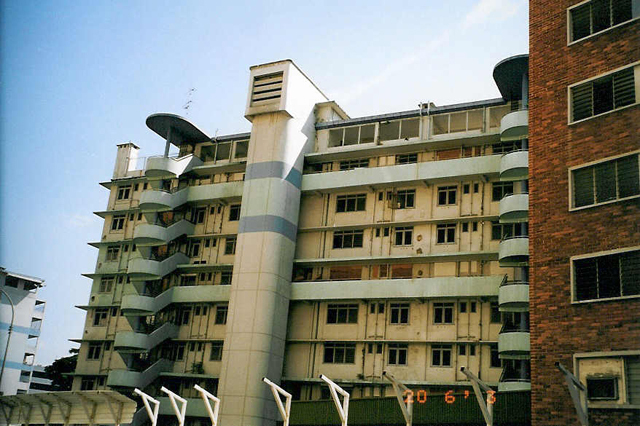 The facades of the SIT flats along Upper Pickering Street facing Hong Lim Park and the Criminal, District & Magistrates’ Courts. “The SIT office occupied the centre block”, says the caption that accompanies this postcard photo found online. SIT Flats along Upper Pickering Street slated for demolishment, 2003. Photo uncredited. The photograph was shot from within the entrance portico of the court building, facing the SIT flats along Upper Pickering Street. Prior to the current Subordinate Courts along Upper Cross Street, this was the place to be for witnessing the court trials of the alleged, the criminals and perpetrators of petty crime; where one would stand trial for illegal striking, rioting or unlawful assembly, traffic offences, attempted suicide (à la Hussein in “Korban Fitnah”) and corruption (à la the recently acquited Ng Boon Gay). In the early years, caning as punishment was also carried out in the building. The Magistrates’ courts took an active role in the wide-spread clamping down of left-wing organisations and activities in the 1960s. Probably in cahoots with the then-Lee Kuan Yew-led PAP government. 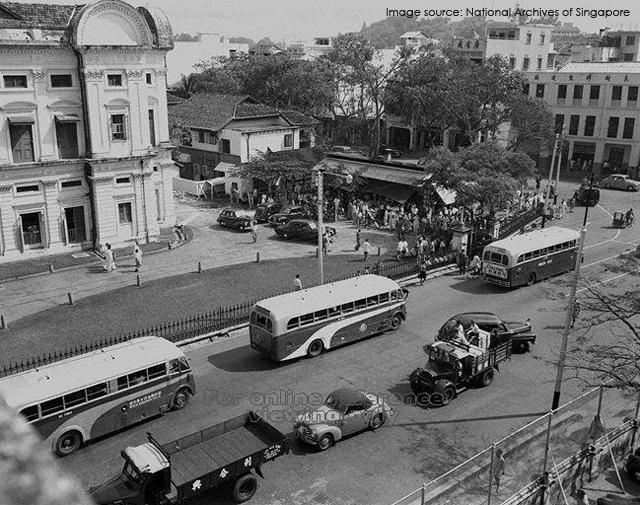 The Criminal, District & Magistrates’ Courts along South Bridge Road in 1975. The Criminal, District & Magistrates’ Courts being demolished in 1975. This photograph was probably shot from the high-rise SIT flats along Upper Pickering Street. 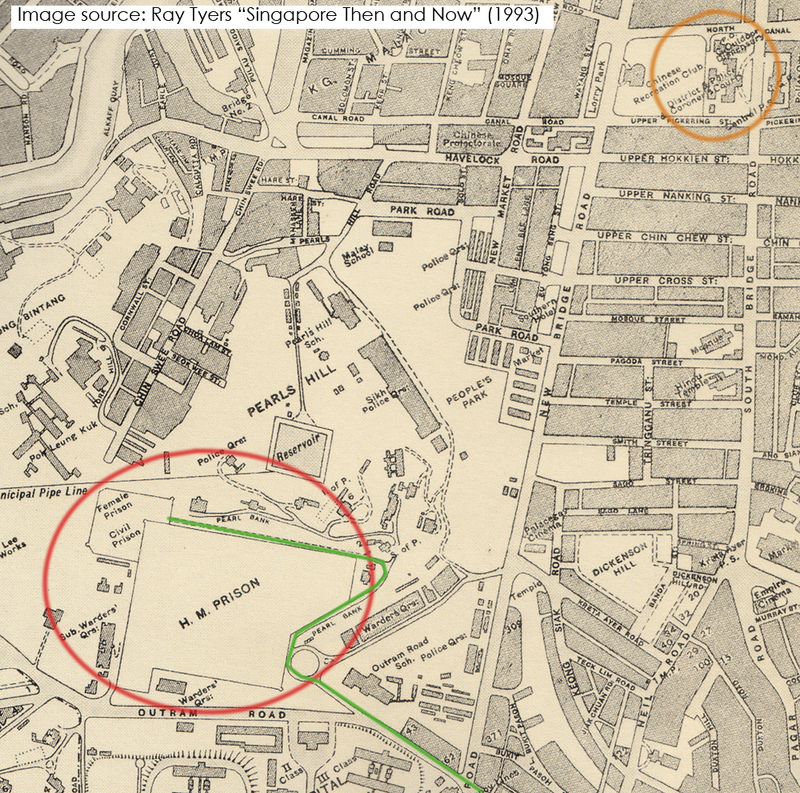 Hong Lim Park lies to the left of the photograph. Almost forty years on (since 1975), one would be hard-pressed to locate any remnants of what once stood in the vicinity of the Police Courts and Hong Lim Green (other than the Kreta Ayer Police Post, the outdoor stage and a few of the shophouses along North Canal Road.) 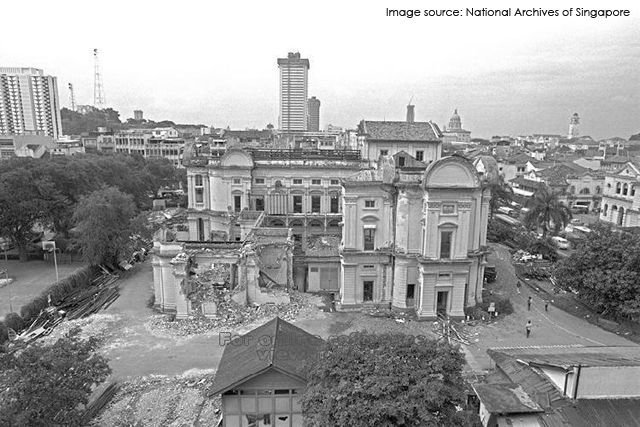 The Police Courts, Central Police Station and the SIT flats were demolished. In their place, new glitzy office blocks and trendy hotels were built. Hong Lim Park was not what it used to be — it had became a ‘Speakers’ Corner’ with a police post and surveillance cameras watching over it. This post is Part 2.